I needed an assortment of cookies for tomorrow’s luncheon, and since I already did lava cookies and brownies. I decided to make the third cookie non-chocolate. This recipe is based on one by Carol Walter, though I made a few changes — my favorite being the cayenne pepper. It adds more zip to the cookies, but not so much that a child wouldn’t like them. In fact, Fuzz likes these more than just about any other cookie. They’re big, soft, but still sturdy and they should keep well. These ginger cookies are big, soft and chewy. They're perfect for bake sales or gifts. Preheat oven to 350 degrees F. Have ready two or three large cookie sheets lined with parchment or Silpats. Using an electric mixer, beat butter until creamy. Beat in shortening, then add sugar, 1/4 cup at a time. Continue beating for another minute. Beat in egg, vanilla and molasses. Shape dough into 12 evenly sized balls (a little bitter than golf balls). Roll the balls in sparkly sugar. Place 3 inches apart on cookie sheets and bake one sheet at a time on center rack of oven for 13-15 minutes. Cookies should appear cracked on top but still slightly soft. I’m looking for a big soft ginger cookie. I will make this tonight but instead of rolling them(cookies) in sparkly sugar I thought I would give them a light lemon glaze. stumbling upon this page, i am very excited to do this. im only 18, and i have this huge obsession of baking. though i don’t usually eat what i bake, it’s quite odd and a little bit strange, everyone loves what i bake and i’ve been giving my baked goods to people on special holidays and occasions. i am very detailed and everything must be clarified. im wondering, when your ingredient list called for cocoa powder, are you referring to the sweetened or unsweetened? No need to hide your baking addiction around here! About the chipotle, I don’t think it would be that great. It’s good in chocolate, but if you leave the pepper out you’ll still have a really good cookie. A good place for the chipotle powder would be peanut butter cookies. I like adding it to my one bowl peanut butter criss cross cookies. Just found your site, and just found i have a hidden baking addiction. These sound awesome, but i was wondering…I dont have cayenne, but have chipotle powder…would it do sort of the same thing in terms of flavor? or would it just be disgusting? My Dad loves spicy food, so i made these for him, but I added red pepper flakes to them. They looked very festive and added an intensified kick for more adventurous eaters. Absolutely loooove this recipe, thanks so much! I just baked these now: I was nervous about the cayenne pepper but wow it’s a neat addition. I used regular granulated sugar instead of “sparkly” but everything else the same. Good mix of crunchy on the outside and chewy inside. 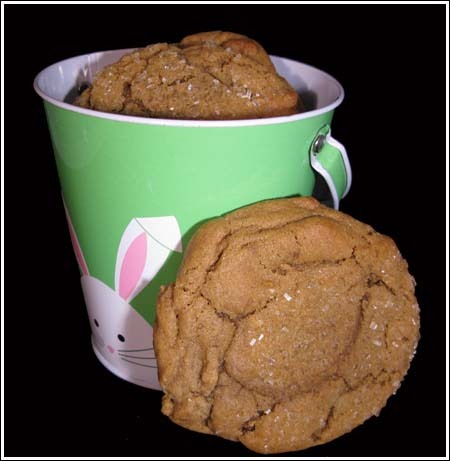 You gave me a big ginger cookie recipe a couple years ago that everyone loved( it uses all shortening). Btw, have I told you I’m baking at a market? I’m working for a caterer who works out of the market. http://www.cheflescooks.com. I go into work today and he has all these recipes from your site printed off( he found you thru me). We’re trying new things to sell( my stuff is selling like crazy!!) and I mentioned large cookies A LA starbucks. I tried a choc. chip one today from Marcy Goldman, but it spread way too much and was too thin. What would you suggest? Dietrich’s Country Store 660 Old 22, Lenhartsville, PA 19534; 610-756-6344. That’s it. I’m on a mission to find lard. I wonder if I can order it online? Jen, it’s hard to say. My other recipe is 100% shortening and since shortening has been giving me a stomachache lately (probably psychological, but still…) I guess I choose these. Lara, hope you like them! Claudia, thanks for the report. I made these last night and they are SO good. This is going to become a family favorite. They were great yesterday still warm from the oven but they are even better this morning! Oh my gosh, these look amazing. I might have to make them…TONIGHT. So, which ginger cookie do you like better? This one or the your other Colossal Ginger Cookie? Hi Cass, I’m glad you like that recipe. I think putting the dough in the refrigerator might make the dough a little too firm to roll. It might work, but my worry is that you’d have to work really hard to get it flattened and then by the time you got it flattened, it would be too soft and greasy to work with. If you try it, let us know. Meredith, I like to plug all my dough into The Matrix so The Oracle, a good friend of mine, can borrow some. She hates making it herself, but she enjoys cutting and baking. Neo likes cookies too. This isn’t a comment about this cookie but about the Lazy Mum’s Cutout cookie. I have made these already and they were very popular so I decided I am going to make rabbit ones for my daughters class. What I wanted to know though was could you put the dough into the computer to firm up before flattening and then roll out once firm. I love ginger cookies, especially when they are soft. I will have to try your recipe as it is a bit different than the one I always use. Room temperature butter is obviously easier to deal with and blends together nicely with the sugar, but cold butter makes for a thicker dough and it seems (from my experience) a more flakey cookie. These look great. I might make them and add some chocolate chips for good measure! Here’s a question: why do some recipes call for room temperature butter and some for cold? NP, you will love these. They are nice and gingery. Katy, after I posted it, I went back and looked at an old recipe of mine called “Colossal Ginger Cookies”. This one is very similar in proportion to that one. I guess all the big ginger cookies are cut from the same cloth. I didn’t know Martha had a new cookie book. Thanks for the tip! Almost exactly the same recipe in Elinor Klivan’s fantastic Big Fat Cookies and one of our all-time favorites, too. Just bought Martha Stewart’s new cookie book. It looks great. I had many of the recipes already but it’s nice to see the full color photos. These look great. I love a little gingery-ginger in my cookie. I think it’s a treat.